Mass shootings are as American as imperialism and apple pie. And by George, here we go again; yet another school mass shooting in the United States of America. Just two months have passed since this plague of violence visited the grounds of Marjory Stoneman Douglas High School located in Parkland, Florida. Ironically, only a few days before this violent act, Parkland was ranked as the safest city in Florida and the 15th safest in the United States. Now, it has the grim distinction of having the fifth deadliest school shooting in the history of the United States. Columbine, Virginia Tech, Sandy Hook, Umpqua, Red Quake, Isla Vista—in the past 20 years, the US has had a series of unfortunate school massacres. And that does not even include other mass shootings that have happened outside of schools. In fact, three of the five deadliest mass shootings in US history-Las Vegas, Orlando nightclub and Sutherland Springs-have transpired within the last two years. To make things worse, the Parkland tragedy was already the 17th school shooting in just the first 45 days of 2018. The events of February 14, 2018 took away the lives of 17 people and caused physical harm to 17 more non-fatal victims. But just as tragic, it has permanently taken away the innocence of some 3,000 young students who will have to live every single day for the rest of their lives with those mental scars. The memories of the sights and sounds of an AR-15 rifle ringing down their hallways, their friends and teachers laying down in pools of blood and death staying with them. The events in Parkland have forced both the leaders in government and the rest of the nation to ask the question that they have tried to avoid for so long: “How do we prevent another mass school shooting from ever happening again?” In town halls with President Trump and Republican Senator Marco Rubio of Florida, the survivors and their parents voiced out their many proposed solutions. They demanded metal detectors and increased school security. They pushed for stronger background checks for those who wish to buy guns. The students and parents of Marjory Stoneman Douglas High School also pointed to Australian gun laws as a possible model to solve this crisis. In 1996, the Port Arthur massacre claimed the lives of 35 people and injured 23 more after a gunman carried out an attack using two semi-automatic weapons. Subsequently, the Australian government urgently passed a law that restricted the sale of all semi-automatic weapons to private citizens. In addition, the government implemented a mandatory buyback of all the newly-banned guns from citizens. In total, the Australian government spent $ 500 million to buy back the over six hundred thousand surrendered guns. The result: Since 1996, Australia has had a grand total of zero mass shootings. The specifics of the new gun bill, which is now known as the “Trump Weapons Amendment”, requires all teachers serving in US public schools to carry a semi-automatic weapon at all times when in school premises. To ensure strict implementation, the bill will incentivize gun-carrying teachers and penalize those that come to school without guns. One of the said incentives was a $1 million reward to any teacher who successfully guns down a would-be school shooter. “It’s in a man’s conscience to have access to weapons and not use it to protect the kids,” said Rep. Lorenzo A. Tellano, one of the authors of the bill. As a result of the impending passage of the bill-the final details of which are being hammered out in Capitol Hill-there’s a new retail entrant that awakens staggering shopping mall sales. 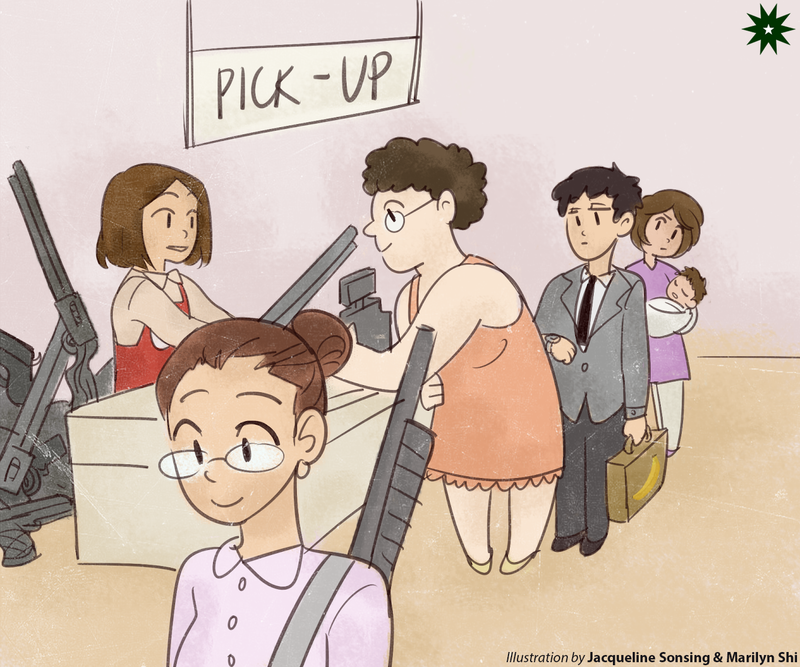 Flocking to join the meter-long queues, the teaching staff and personnel of Marjory Stoneman Douglas High School received access for discounted gun merchandise. Soaring past expectations, first day sales recorded higher figures than those from last year’s holidays. “We’ve never seen more eager shoppers and better discounts,” says Keegan, one of the retailers. Florida’s elected officials have expressed their support for the proposal. “I believe this is the solution to the school mass shootings that has eluded us for years. When a shooter comes in, the teachers need to be ready to step into the frontlines and take down the shooter, ” said Florida governor Rick Scott. Sen. Marco Rubio echoed the same sentiments saying, “We have to fight fire with fire. We can’t just simply pray and wait for the police to come as the shooter fires down shots on our kids,” The National Rifle Association also gave a ringing endorsement to the proposed bill. “Our teachers have a right to be armed, for those qualified to have access and use it for their protection if the situation demands,” said NRA EVP Wayne LaPierre. The students of Marjory Stoneman Douglas have also expressed their strong doubts, if not outright opposition, to the President and Congress’ new solution. They pointed out problems with the proposal such as what would happen if a teacher becomes the shooter and turns the gun on the students? President Trump responded by pointing out that, “Under the old system, we would have to wait for the police while the students get slaughtered. Now with this new tremendous bill, teachers in the next classrooms would be able to fire back-bing, bang, bang-done and the attack is stopped.” Trump also pointed out that an added benefit of having guns inside classrooms is that it would help teachers discipline the kids and improve their behavior. “Our kids now, they’re not tough. They don’t know the meaning of discipline. They’re too noisy. You know back in the old days, our teacher would hit us and it made us tough. But now, students are all over the place. But when they see that gun, oh boy, things are really gonna change. Believe me!” said the President.